JP and Paul Norden each lost a leg in Monday's bombings at the Boston Marathon. Two brothers who went to the Boston Marathon to cheer on a friend each lost a leg in Monday’s bombing, their family said, asking the public for prayers. 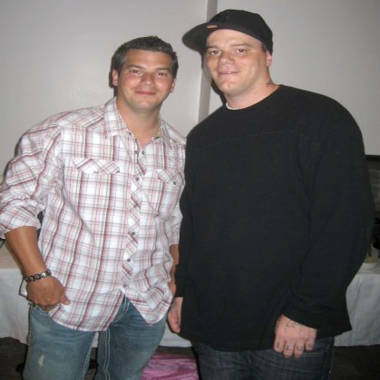 Paul Norden, 31, and his brother, J.P., 33, were being treated at separate hospitals on Tuesday, their worried relatives rallying around them. “J.P. is alert, knows what’s going on,” their mother, Liz Norden of Wakefield, Mass., told NBC News via text message from the hospital. “[He] knows he lost his leg. He is in a great deal of pain,” she said, adding that he had a loud, incessant ringing in his ears from the blast. The emotional wounds were just as bad, she said. J.P. had already undergone surgery, while Paul was back in the operating room on Tuesday afternoon. “All I ask is to please, please pray for all of them,” the mother said. Norden said Paul emerged from surgery late Tuesday afternoon. His mother said he is not able to talk yet but he squeezed her hand and tried to get up when she told him J.P. had survived. "This is just overwhelming," she said. On Monday, Liz Norden told the Boston Globe she was unloading groceries when she got a call on her cell phone from Paul, who was in an ambulance. "Ma, I'm hurt real bad," he told her. She soon learned the her elder son, who had been standing next to him, had also lost a limb. “I am just so heartbroken,” she told NBC News as she shuttled between Beth Israel Deaconess and Brigham and Women’s Hospital. Paul’s girlfriend was being treated for burns at a third hospital. The brothers, both roofers who had recently been laid off, were at the marathon to support their friend, firefighter Mike Jefferson, who escaped injury. “I was a quarter-mile away from the finish line,” Jefferson told the Globe. Three people were killed in Monday's twin bombings, which also injured at least 176 people. Authorities have not yet named a suspect in the attack. Lee-Ann and Nick Yanni were standing about 10 feet from the finish line cheering on friends when the bombs went off. Shrapnel ripped through Lee-Ann's shin, causing her to need emergency surgery for an open fibular fracture; Nick sustained a pierced ear drum, NBC's Kerry Sanders reported. 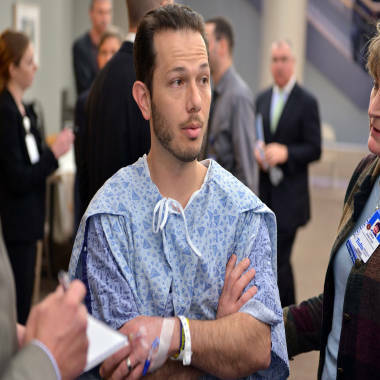 Nicholas Yanni, 32, of Boston, speaks to reporters at Tufts Medical Center in Boston. 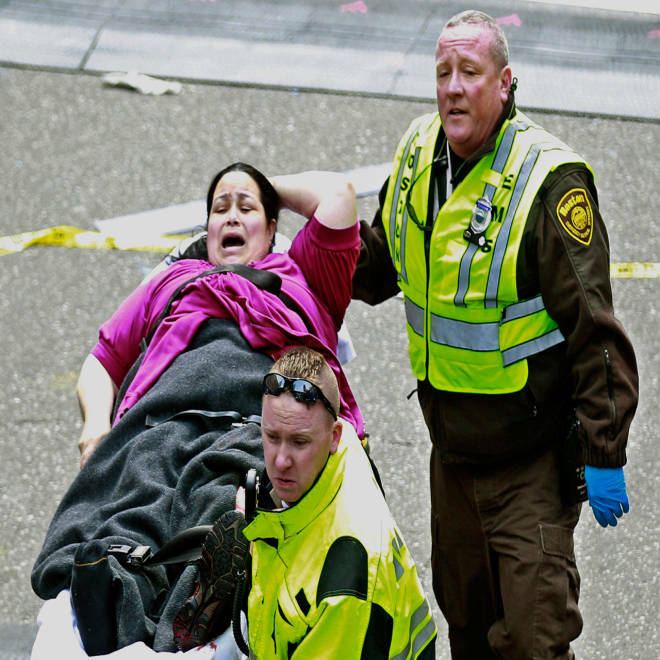 He and his wife, Lee Ann Yanni, 31, were injured in the Boston Marathon bombing. "It sounded like somebody had taken a cannon or some kind of bomb or something was right behind me," Lee-Ann told TODAY from her hospital bed. "You could smell gunpowder and probably flesh at that point." Lee-Ann was waiting for a skin graft Tuesday morning. "People were on the ground. A lot of broken limbs – I think I saw a guy with no limbs at all," Nick told TODAY. Among those killed was 8-year-old Martin Richard of Dorchester, Mass., who was watching the race with his family, NBC affiliate WHDH reported. Martin's 6-year-old sister lost her leg in the blast; his mother suffered a serious brain injury and had surgery late Monday night, WHDH said. "The kids were all up on the barrier," said Rep. Stephen Lynch, D-Mass., who told MSNBC's "Morning Joe" that he spoke to Martin's father, William, after the bombings. "They had their feet up on the pegs, trying to get a higher view. ... So they were all focused forward and the blast came from the back and the side." The family also has a son in the fifth grade who was not injured, according to WHDH. William Martin, the father, is a runner but was not running in yesterday's marathon and was not injured, Lynch told MSNBC. The family was there to support friends who were in the race. See images from the scene of the explosions.